Axonom demonstrates visual rack configurations with color-coded dynamic wiring, and offers attendees a VR experience of a designed data center in booth 742 at Data Center World 2017. Los Angeles, CA- April 5, 2017 Axonom, a global provider of visual configure-price-quote (CPQ) software, today unveils its 3D Product Configurator and Virtual Reality Data Center Rack Design Exhibit at Data Center World Global 2017, the global conference for data center, facilities and IT professionals. The visual product configurator and virtual reality (VR) station gives conference attendees a first-hand experience how to configure racks and rack components, visualize cabling connections, interact with components, and explore the data center room layout. "Visual Product Configurator and Virtual Reality together is a strategic business tool for consumers to make better, more informed buying decisions," said Mike Belongie, COO at Axonom. "Data center racks have a number of complex components, wiring, and configuration possibilities. The slightest configuration change may result in a dramatic price increase. 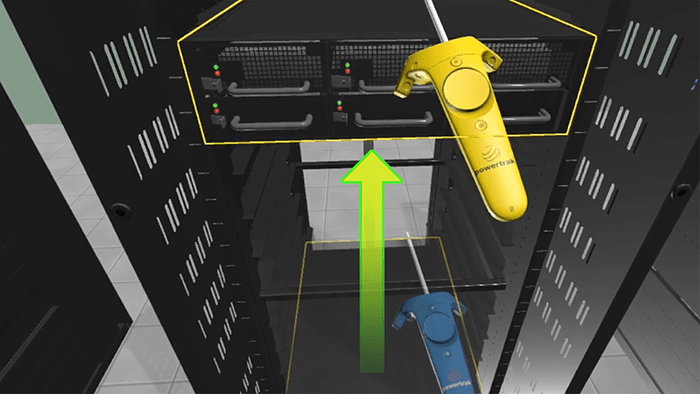 Powertrak 3D Product Configurator and Virtual Reality enable consumers to move storage and server units from slot-to-slot to see how each change affects cabling length and BOM cost." Powertrak 3D Product Configurator is a cloud-based quoting, ordering, and configuration solution designed for manufacturers to provide its sales, dealers, and customers with a platform to visually custom build racks and design data center floor plans. The virtual reality experience, powered by Powertrak VRoom, transports users directly into a virtual data center facility where they can explore the designed room and interact with a rack’s servers, storage, and power supply products using the HTC Vive. Together, Powertrak 3D Product Configurator with Dynamic Wiring and VRoom combine to deliver a complete design-to-order-to-experience solution suite. These solutions enable users, with little-to-no technical knowledge, to design with confidence, order accurately, and experience first-hand the designed racks and data center room layout prior to purchase or installation. Axonom welcomes Data Center World attendees and exhibitors to booth 742 for demonstrations on configuring data center racks using Powertrak 3D Product Configurator, then experiencing the design in virtual reality. "We invite everyone to design a rack using our configurator’s stunning, three-dimensional product models, and then experience it in VR. Virtual Reality has become a powerful tool for us to develop a connected sales experience with trade show attendees and leave them more informed, engaged, and comfortable with Powertrak Product Configurator," said Belongie.